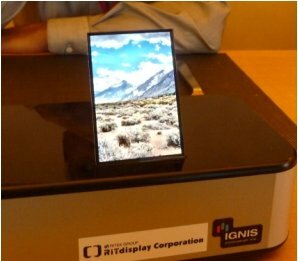 There are reports that RiTdisplay started to mass produce 3.5" 320x480 AMOLEDs on a-Si backplanes, and the company was already contracted to provide the displays to several smartphone makers. a-Si backplane AMOLEDs will be cheaper and easier to produce than LTPS ones (which is the most common technology for AMOLEDs and next-gen LCDs such as Apple's Retina displays) as they can use existing a-Si equipment used to fabricate LCD displays. Canada's Ignis Innovation provided the compensation technology and driver IC (which is made by Himax). These are the same panels unveiled at SID last month. The actual backplane was developed with an undisclosed display-panel maker partner in Taiwan.